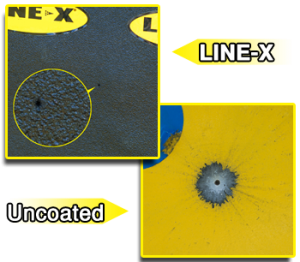 The LINE-X PAXCON® spall liner (PX-2100) is a spray applied coating that can be applied to Dyneema®, armored vehicles, breastplates and other military equipment. PX-2100 was developed to absorb the impact from projectiles, therefore stopping both the projectile and the armour plating from spalling. Spalling occurs when an object fractures and fragments upon impact of another surface, for instance when a bullet hits metal armour plating part of the bullet breaks up into tiny shards of metal that fly out at high pressure. It is these shards of bullet that cause injury or even death.